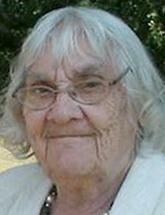 EVANSDALE - Ida Mae Blanchard, 95, of Evansdale, died Sunday, July 27, 2014, at Ravenwood Nursing and Rehab, Waterloo, of natural causes. Ida worked in Waterloo at Morg's Café, and then at Allen Memorial Hospital in the housekeeping department and later in the kitchen until her retirement. Survived by two sons, Rex (Patsy) Tabor of Mulberry, Ark., and Robert Tabor of Cedar Falls; a daughter, Ruth (Gary) Matthews of Fairbank; 14 grandchildren; 25 great-grandchildren; five great-great-grandchildren; a brother, Leonard Ohl of Hazleton; and two sisters, Virgina Steen of Waterloo and Evelyn (Owen) Brickman of Harpers Ferry. Preceded in death by her parents; a son, Larry Tabor; two grandsons, Jeff and Bobby Tabor; a great-grandson, Michael Trumblee; two sisters, Wyonna Rankin and Velma Ohl; and six brothers, Donald, Martin, Arthur, Floyd, Alfred and Ralph Ohl.